Two Pallywood duds in one day! Another day, another Palestinian hoax. 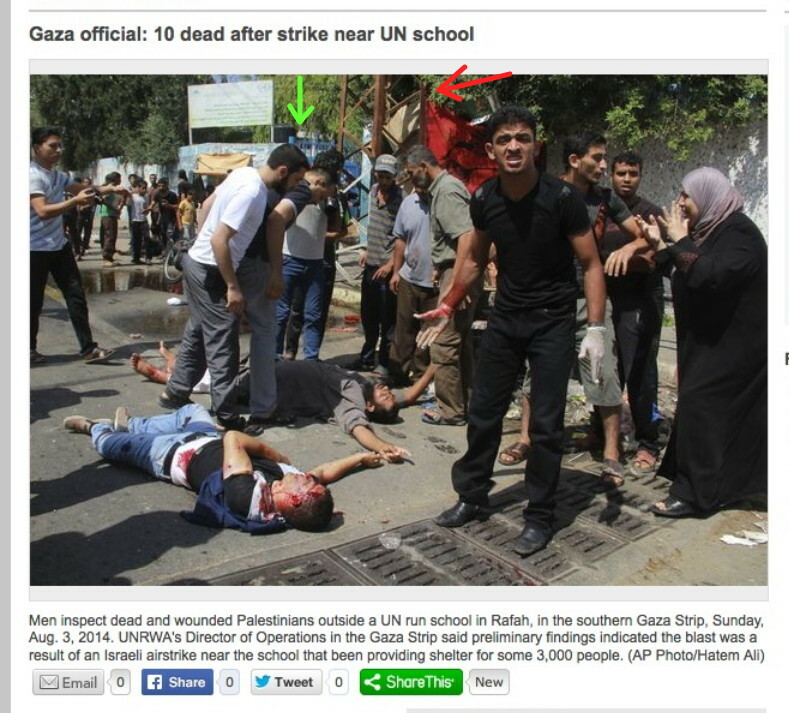 Actually, August 3, 2014, brought us two Pallywood duds. 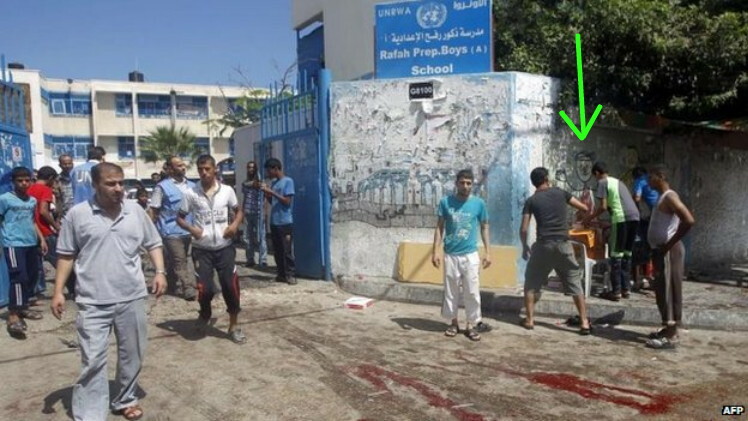 The first production I’ll discuss is the bombing of the al-Ghoul house in Rafah, which is said to have killed ten people. 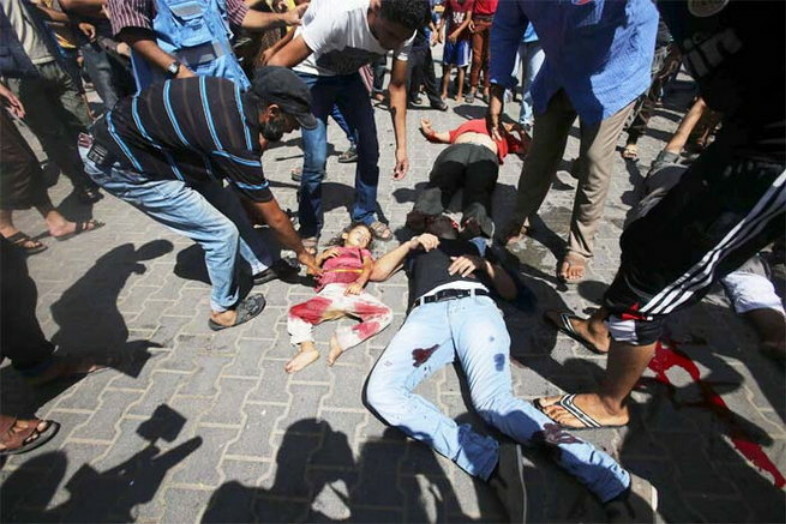 The second is the “air strike” on the Rafah Preparatory “A” Boys School, which I will PROVE to you did not happen. 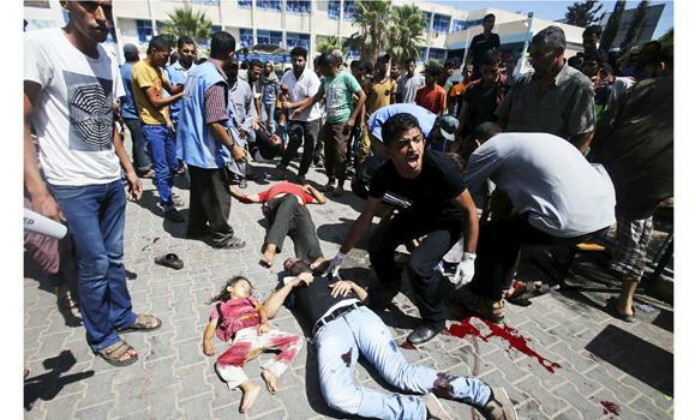 The Israelis did, in fact, bomb the al-Ghoul family house in Rafah. There are photos of dead children. We’re told that ten people were killed, including three adult men. Asmaa al-Ghoul, a journalist from the family based in Gaza City, said in a post on Facebook that her uncle Ismail and his sons Muhammad and Wael were killed this morning along with Wael’s three children Malak, Mustafa, and Ismail. Who is Asmaa al-Ghoul, you ask? She’s a Palestinian journalist. In 2007 she wrote an open letter to her uncle, a high-ranking Hamas commander. In August of 2010, Human Rights Watch awarded her a Hellman/Hammet Grant for the persecution she faced at the hands of Hamas and her uncle. 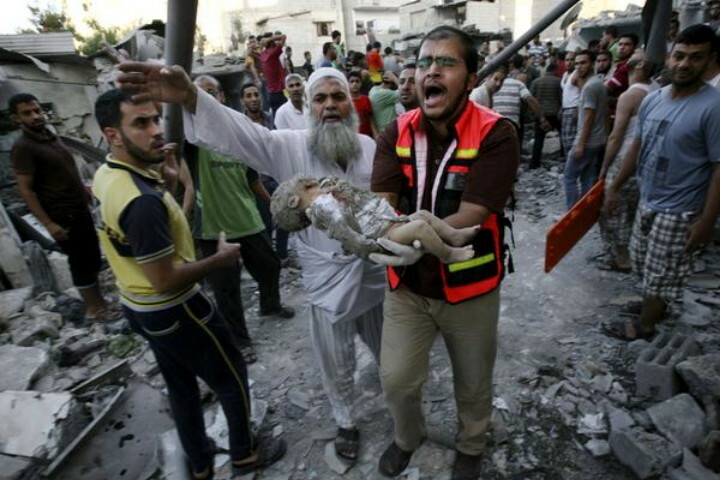 The Israelis bombed the al-Ghoul house because it was a Hamas target. Hamas operatives and area commanders, as well as their rocket cell members, keep one part of their home for normal family life. A second part of the home is the command center, or the start of a tunnel. Daily life and military infrastructure are totally interwoven. Not a single story out there will tell you that a top Hamas commander lived there, putting his entire family at risk. 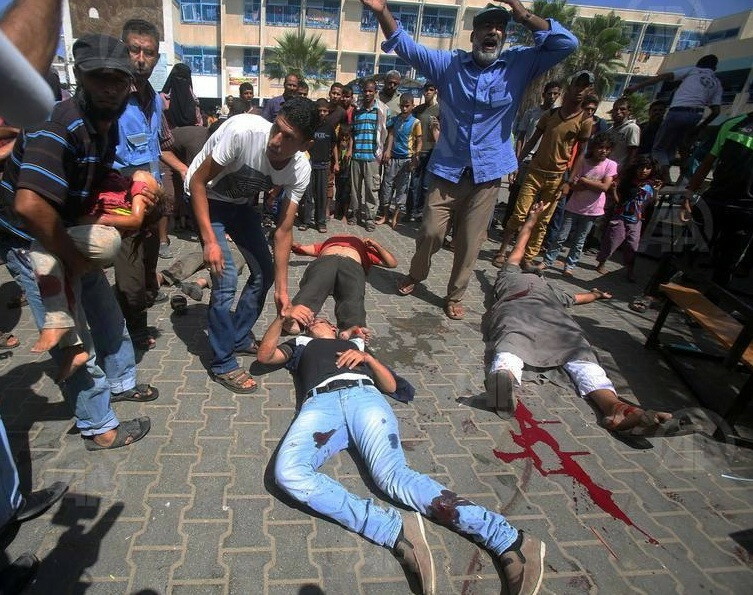 Hamas started this war and conducted it in the most depraved way possible. Every death on both sides is the fault of Hamas. Children don’t deserve to be bombed, but more importantly, they don’t deserve to be used first as human shields and then as props. 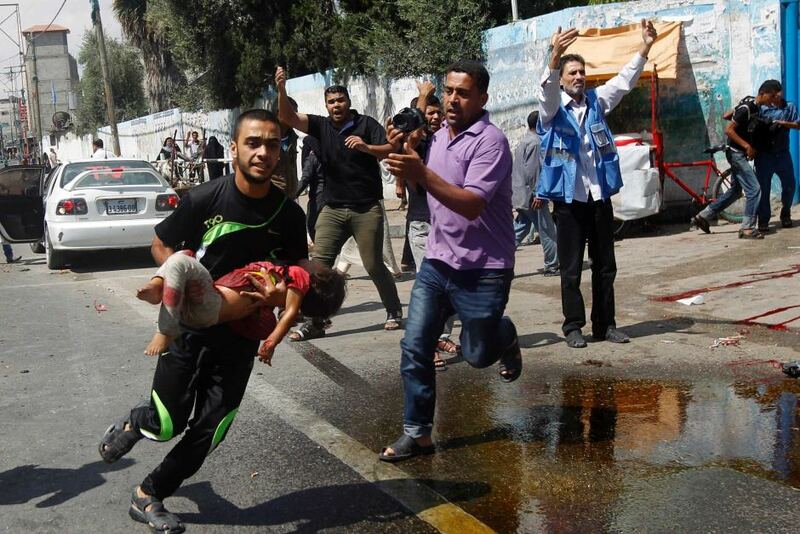 Every man in that photo is glad that the baby is dead, because now they can feature him in their hideous propaganda. These are some of the most degenerate people in the world. From In Your Eyes a Sandstorm: Ways of Being Palestinian, by Arthur Neslen. Page 61. 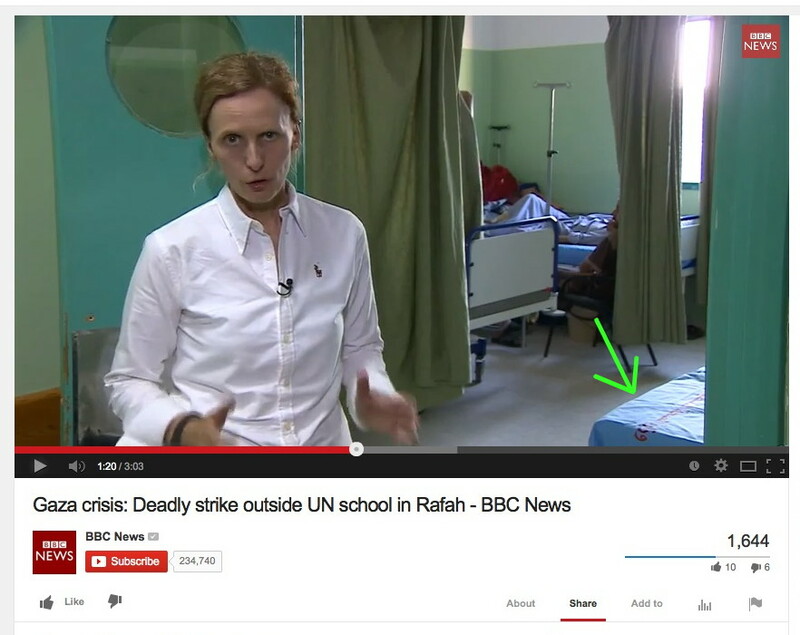 Now for the other Pallywood dud of the day. As expected, the usual suspects began shrieking at the tops of their lungs, based on complete lies. The press said the school was bombed, missiled, and hit with artillery strikes. Ban Ki-Moon uttered something in his incomprehensible English, and the stenographers of the press interpreted it. It was the second strike on a school in less than a week. 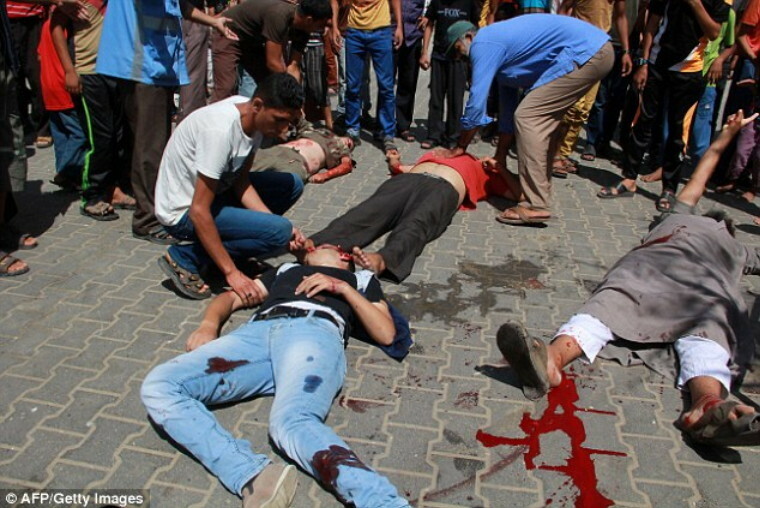 The Israeli military said it had “targeted three Islamic Jihad terrorists on board a motorcycle in the vicinity of an UNRWA school in Rafah” and added it was “reviewing the consequences of this strike”. 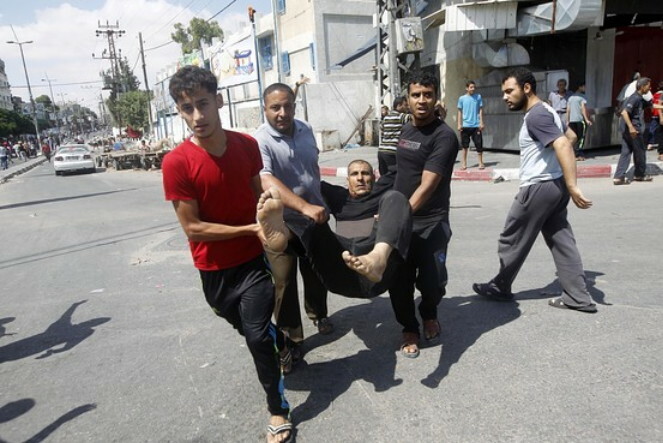 Islamic Jihad did not report any of its militants killed or injured in the incident. 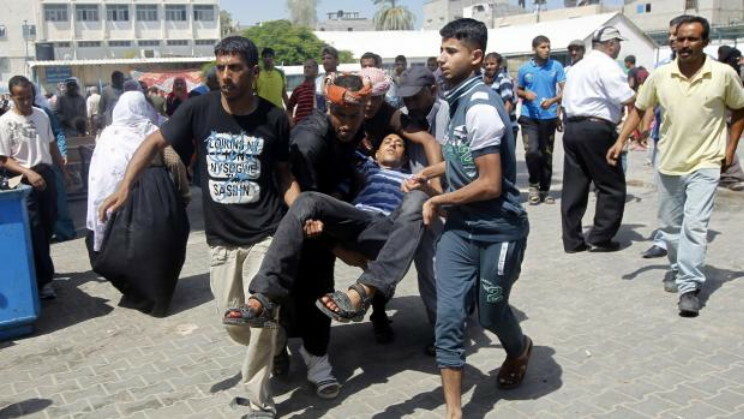 A Palestinian health official said all those wounded or killed were from inside the school. “The Israeli Defence Forces have been repeatedly informed of the location of these sites,” Mr Ban’s spokesman said in a statement. “This attack, along with other breaches of international law, must be swiftly investigated and those responsible held accountable. It is a moral outrage and a criminal act. The Guardian posted what it says is video showing the immediate aftermath of the strike. We’ll come back to the video later. There was a strike, but even the Guardian admits that it happened outside the school. Therefore it wasn’t a strike on the school, and therefore it wasn’t a war crime. Ban Ki-Moon is so incompetent that he needs to immediately resign. He’s making the entire situation worse. Here’s where the strike actually took place. The two men are lying on the asphalt street. The green arrow marks the school gates. On the ground are the two targets of the strike. One has a beard and holds his index finger up in the Wahabbist symbol of there being one God for whom this chunkster will kill and die. The Man in Black with the latex gloves is supposed to be some kind of paramedic, but he’s just an actor, as you’ll see. Note the scaffolding marked by the red arrow. Now, suddenly the two men who were hit on the street are on the school grounds! See the flagstones under them? And a sharp-eyed reader points out that the Wahabbist went from barefoot to wearing shoes! The two targets have also changed places. The Wahabbist was on the other wounded man’s right side; now he’s on his left. 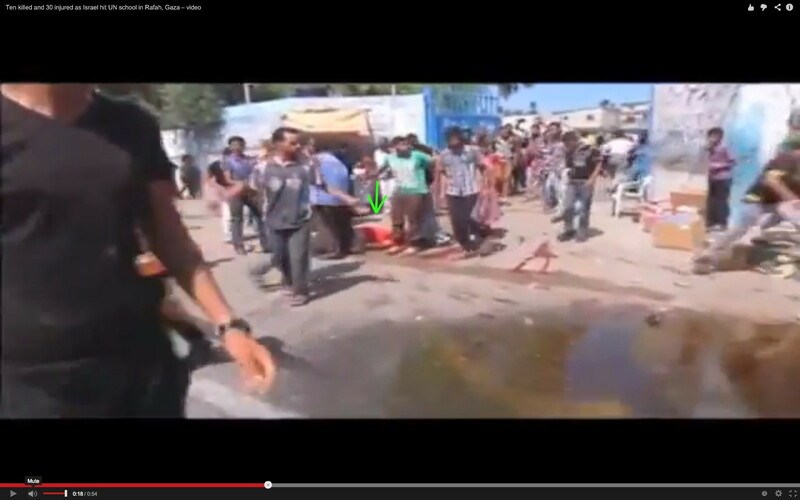 And the man in the red shirt, lying behind both wounded men? The last time we saw him, he was in the street. He’s unhurt. Like almost everybody else, he’s pretending. At some point a little girl appears. Don’t worry; she’s not injured. The Man in Black roars for help, and Red Shirt is still proned out, but the brown-shirted man who was lying next to him is now gone. Here’s another photo of the little girl. Though we’re told she’s dead, her mouth is now open, and Brown Shirt has definitely dematerialized. Like my ghost cat. A man wearing a baseball cap stoops to help the little girl. He picks her up. But wait! Brown shirt is back! I’ve marked him with a green arrow. He’s sitting up, next to his hale and hearty friend Red Shirt. And the men in blue vests? UN workers. The outraged, enraged, raging United Nations was complicit in this little drama. The man who picked up the little girl is getting ready to take her to the ambulance. Behind him, Brown Shirt has gotten to his knees. He’s going to be fine. The Wahabbist on the right is now pointing to where he thinks he’s headed. A graybeard in a purple shirt helpfully screams like a maniac. In the back, to the right, a bored girl in a pink shirt stands with her arms folded. Hey, guess what? I fooled you, because I was fooled. The man with the baseball cap didn’t actually pick up the little girl. 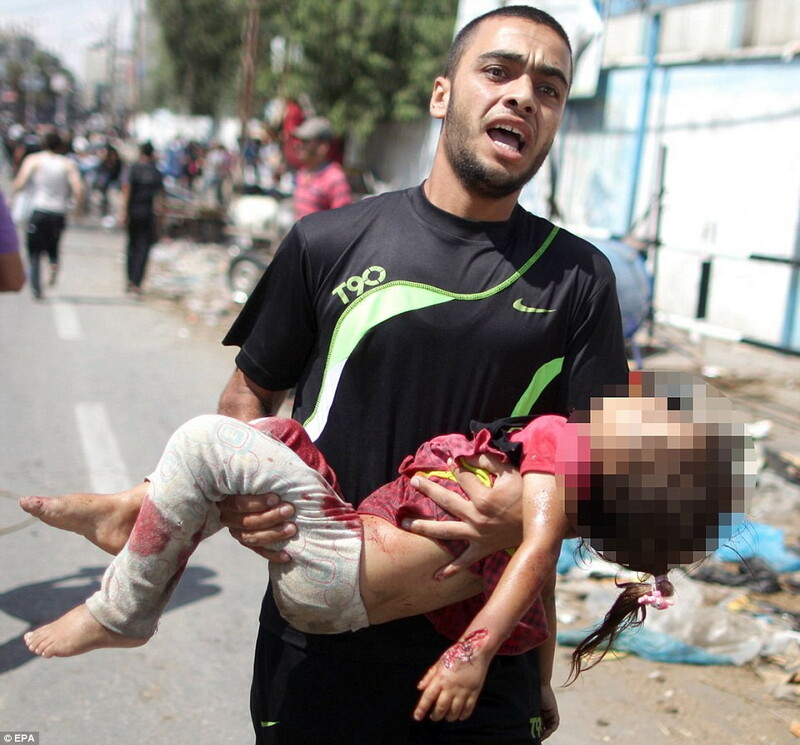 He put her on the ground next to the wounded terrorist, for the benefit of photographers. This placing of props has never before been caught on film. 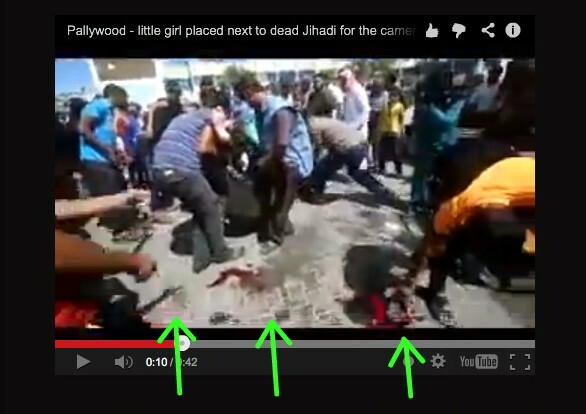 Pallywood is definitely losing its touch. Though it’s a poor quality video, you can see Brown Shirt getting up and walking away. There’s nothing wrong with him. The little girl is also unhurt, as you can see in the photos I posted above the video. Her mouth opens and closes, and her left hand clenches and unclenches. I’ll give you more evidence that she’s all right. 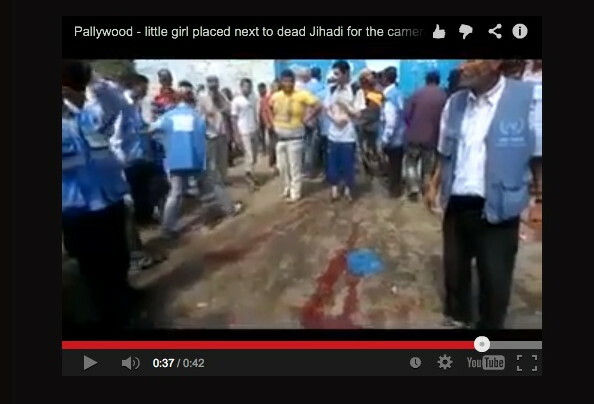 Here’s a still from the video that shows the little girl and the two wounded terrorists. After all three have been taken away, you can see two bloodstains for the terrorists and a damp spot where the little girl was. Not blood; urine. She wet her pants. Despite the “fact” that she was covered in blood, there isn’t any on the ground. If she’d been wounded in the femoral arteries of her thighs at the same time as the two men, she would’ve bled all over the place. She left no blood on the flagstones, nor on the hands of the man who positioned her next to the wounded terrorist. Go back and look at the higher-quality photos. And the UN workers watched her being used as a prop. The UN is utterly corrupt and immoral. By taking part in this charade, it’s ensuring that more people will die. 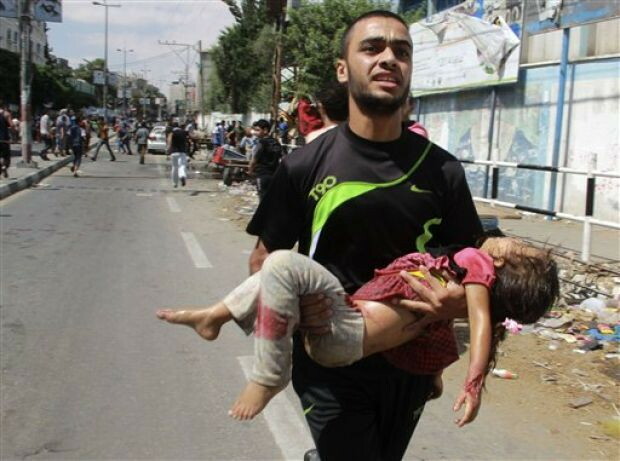 Now a different man sprints through the gates, carrying the little girl to safety. He’s young and fit; his plan is to just keep on running. Forever. Look how far he is from the school gate. Where the hell is he going? The answer is “Nowhere.” The little girl isn’t hurt. They soaked her clothes with fake blood, and she’s obediently playing her part. The young man is running aimlessly because there’s no urgency. Here’s a closeup of the “wound” on her wrist. It’s glued-on rubber or latex. It could even be flour, water, and food coloring. That’s why it isn’t bleeding, and that’s why he has no blood on his hands. Look at her sweatpants; the stains are dry, like paint. And he’s just shouting, with his eyes blank. Crappy acting, my boy. Crap-PEE. Other people picked up unhurt children and ran with them. Note the crone in the shawl, waddling and screeching. There are no visible injuries on that child. I know he’s unhurt, because his “rescuer” grabbed him on the school grounds. 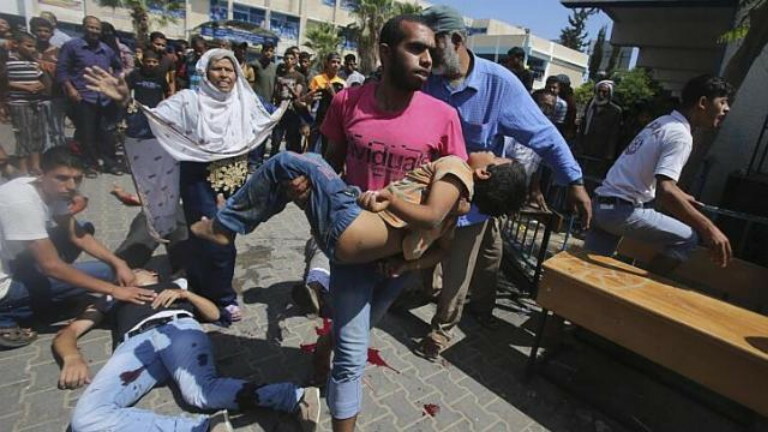 The Guardian already reported that the explosion took place on the street, and we saw the two wounded men lying where they were originally hit, before the Pallywood directors ordered them dragged into the school. Here’s the same man chasing after the crappy actor with the unhurt little girl. He’s left the waddling, screeching crone in the dust. See the blood on the ground? That’s where the two suspects met their fate. They were not hit in the school. And now more proof that this whole thing is a ridiculous farce. See the light-green arrow in the picture above? It marks a cartoon figure. You can see the same cartoon on the wall in the photo below, identified with another light-green arrow. THEY DIDN’T WASH AWAY THE BLOODY DRAG MARKS that show how they brought the two terrorists in off the street so they could claim an “air strike on a school.” Yet look how they’ve removed all the boxes and tables. Bloodstains and drag marks okay, boxes bad. 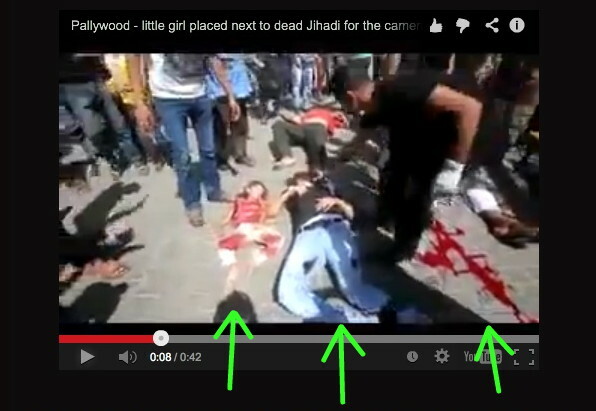 This confused, chaotic Pallywood production went on for hours. Finally, they hauled off Pointing Fatso, his finger still held high. Sometime during the show, a UN car drove in, and they shut the gates behind it. A crowd of men in UN vests stood guard. In the film industry, this is known as a “closed set.” Anything could’ve happened behind those gates. 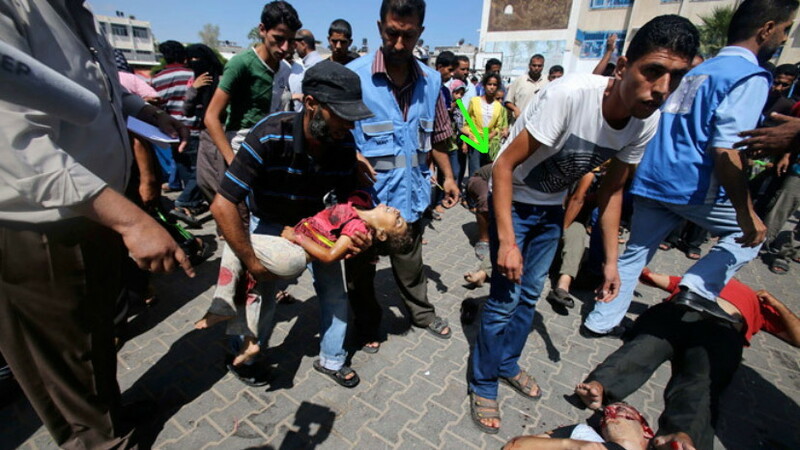 The BBC tried to prove that this was a massacre, but all they did was show that it’s fake. Not one person in this video is injured. Sweetheart, that boy is not in an ICU. It’s a regular hospital room. And he’s got flies all over his face! If he has an open pneumothorax—a sucking chest wound—the treatment requires the administration of oxygen. We saw the unhurt little girl outside getting oxygen. Shouldn’t they have saved it for this child? No, because he too is unharmed. They just sloppily taped a chest tube on him. And why are they treating the uninjured in the parking lot? Here’s an empty bed. I’m sure the hospital has plenty of space. That’s why they didn’t show us room after room overflowing with patients. The Irish reporter said that a Palestinian mother pointed out the exact spot where her ten-year-old son was killed at the school. That’s a lie, because THERE WAS NO STRIKE ON THE SCHOOL. Also, not one of the women is crying. Not even the mother. 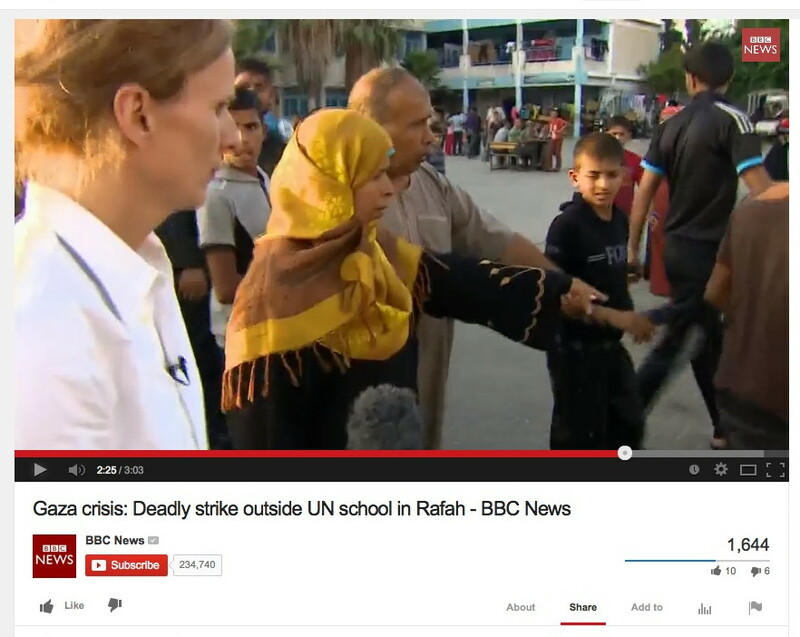 In the BBC video, Robert Turner—the head of UN operations in Gaza—is very upset. We condemn this outrageous act of violence, but how can it keep happening? He forgot that he already admitted that it didn’t happen. In the street outside the school. NOT A WAR CRIME. What kind of munition was used? The Israelis are secretive—as they should be—about their capabilities. I’ve known for a long time that they were interested in miniature guided missiles. They work hand-in-hand with the US on missiles. The US Navy recently developed the world’s smallest guided missile. It’s only 25 inches (63.5 cm) long and weighs about 5.5 lb (2.5 kg). 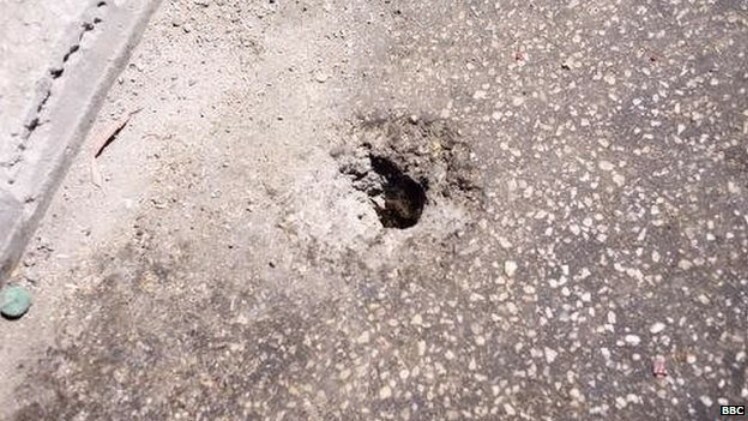 Here’s the crater that today’s munition made ON THE STREET IN FRONT OF Rafah Preparatory “A” Boys School. 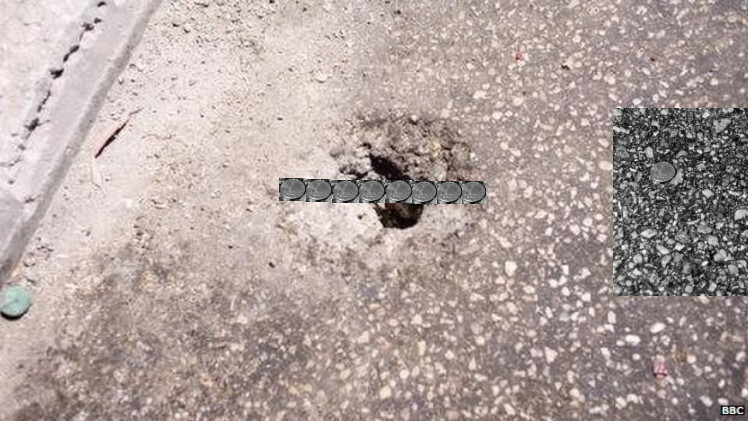 That kind of road is “asphalt concrete.” It’s a mixture of asphalt and small rocks called “aggregate.” The Palestinians use coarse aggregate because finer aggregate is much more expensive. The aggregate is very fine. Here’s coarse aggregate similar to what the Palestinians use. 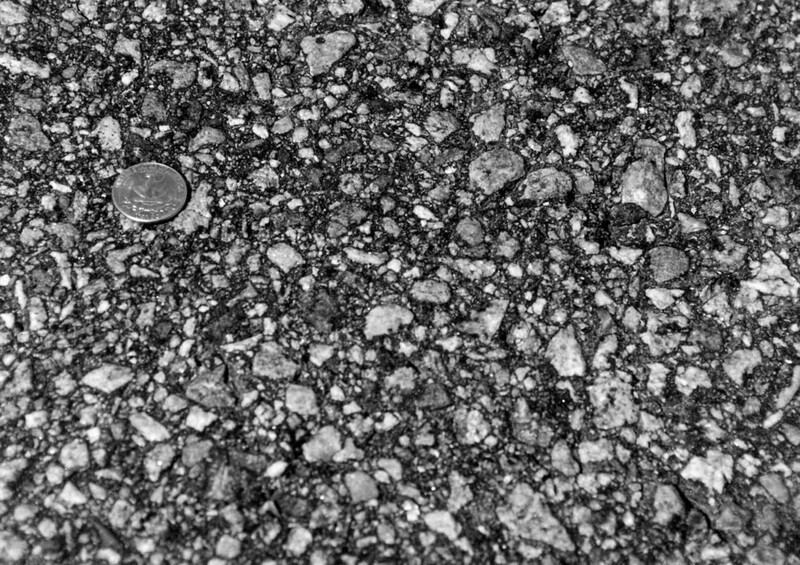 See the American quarter in the upper left side of the photo? 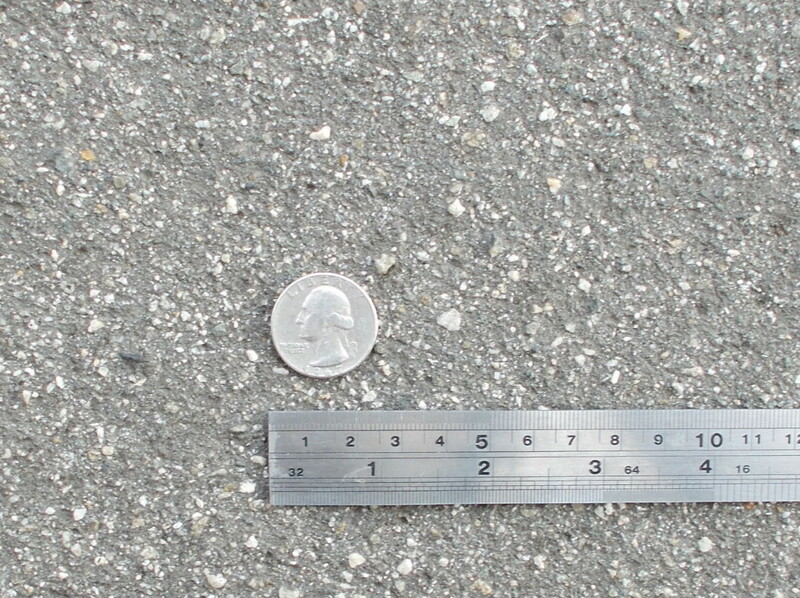 It’s about one inch (2.2 cm) in diameter. Using the aggregate and the quarter, we can determine the rough size of the crater. It’s about eight inches (17.6 cm) in diameter. That means the Israelis have a miniaturized guided missile. This one was probably fitted with a high-explosive antitank (HEAT) warhead, maybe with a fragmentation sleeve. A jet of molten metal cut through the motorcycle and made the hole in the asphalt, while the blast effect and fragments wounded the men. The amount of shrapnel was negligible; you can see for yourself that the two terrorists had only a few injuries. Israel already manufactures an extremely small guided missile called the Spike, which is used on unmanned aerial vehicles (UAVs). 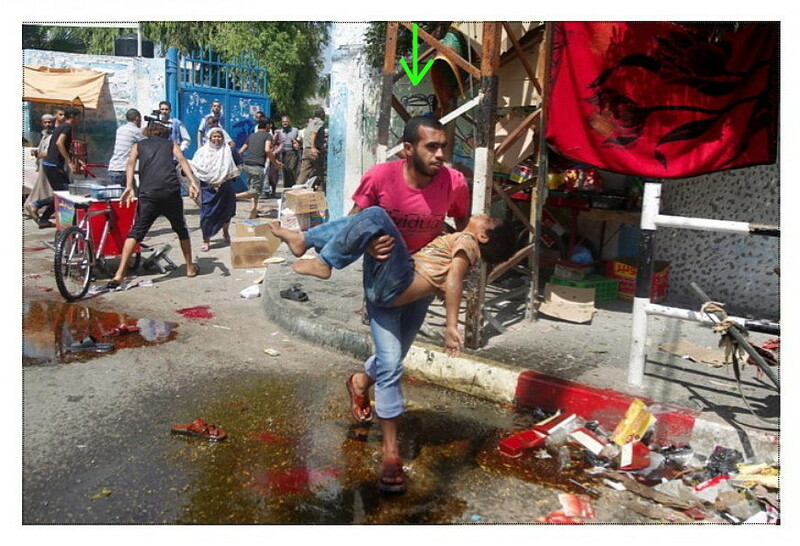 This attack, however, proves that all the jibber-jabber I heard was true: Israel has a tiny guided missile. 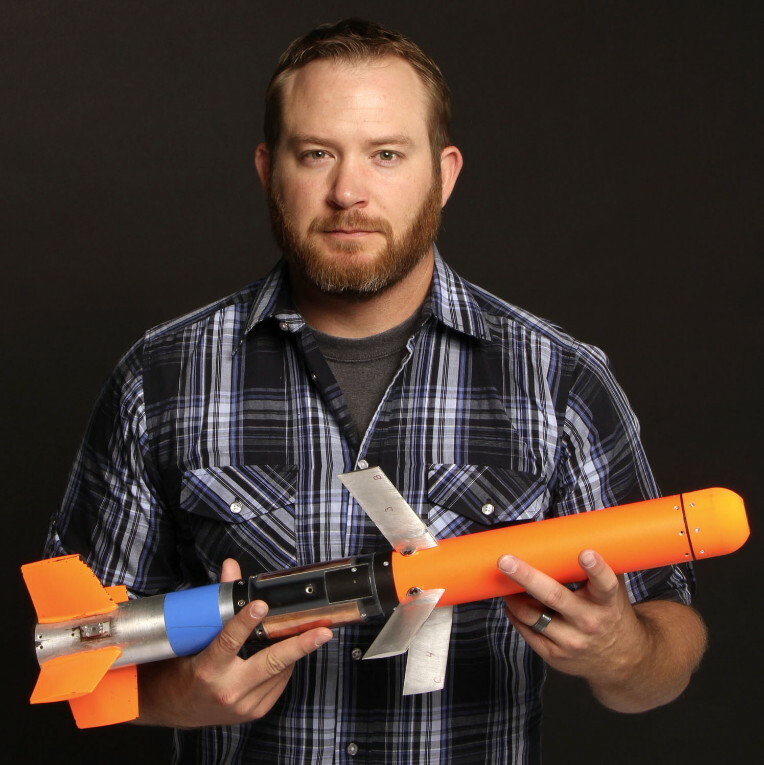 A missile that could take out one person in a crowd. Just like the US Navy…Spike. Interesting name to give it, considering that the US Naval Air Warfare Center Weapons Division denies that their little fella has anything to do with the Israelis. I’ve read that the majority of Israeli UAV operators are women, because they have faster reflexes. In this case there’s no doubt that Israel used a precision strike to take out terrorists, and then Pallywood, the UN, and the world’s press again became victims of their imprinted response mechanism. 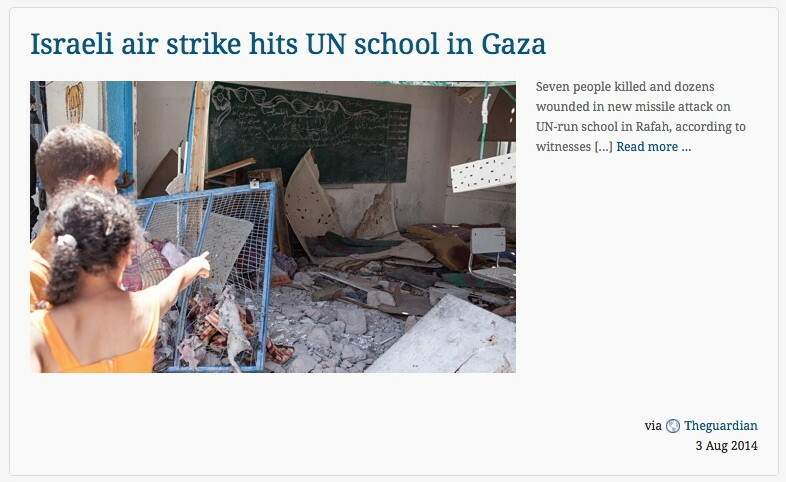 The Guardian even used a photo from the last fake school bombing. Doctor fakers, patient fakers, and journalist fakers. Think of all the money they waste, putting on these hysterical shows of carting around and treating completely unhurt people. All that medical equipment going to waste. 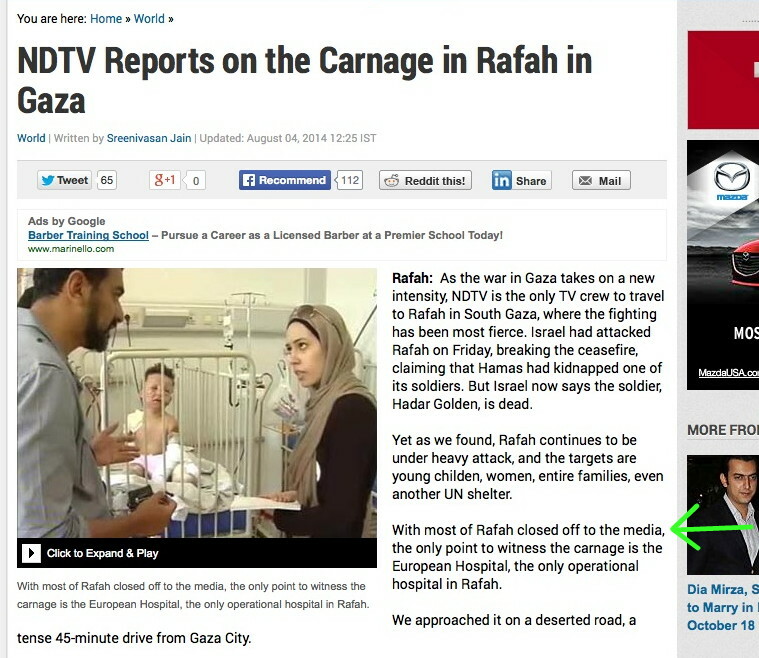 Want to know something interesting about Rafah? Most of it is closed to reporters. By Hamas. Hmmm, wonder why? Everything you’re getting is therefore from the Palestinians or journalists with Hamas guns to their heads. As we’ve now seen, the Palestinians simply refuse to tell the truth, and they go to extraordinary lengths to try and fool you. They even go so far as to turn entire hospitals into off-Broadway playhouses. 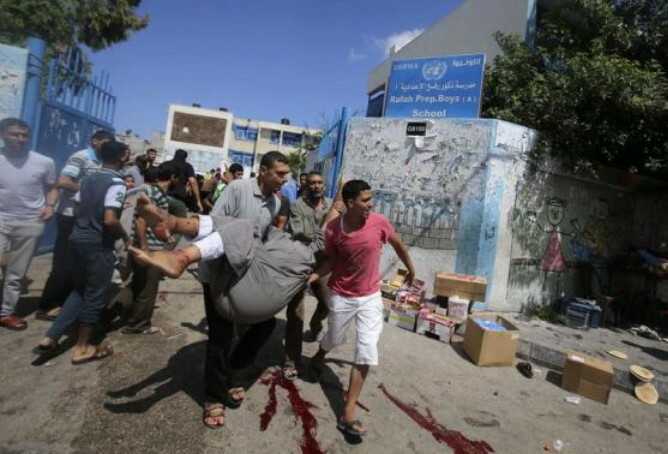 And the European Hospital is NOT the only one open in Rafah. This is from Haaretz, before they suddenly hid it behind a subscription wall. “Unceasing bombardment,” eh? Did you see any explosions in the BBC video? Here’s my rule of thumb: Everything the Palestinians, the United Nations, and the press tells me is a lie. 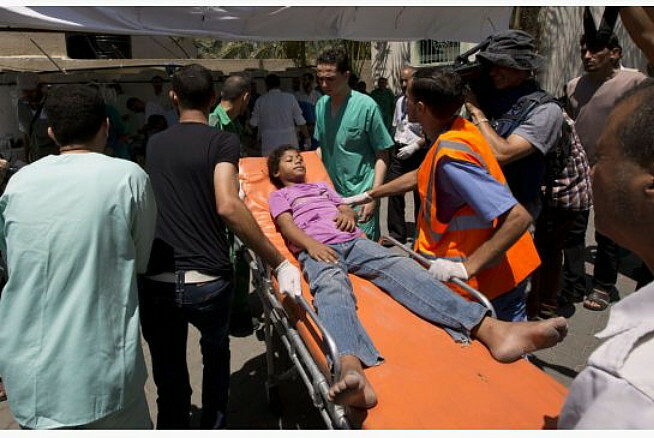 That Haaretz article said that the IDF was “indiscriminately” bombing ambulances, hospitals, residential areas, and even tents…but the Palestinians were going to the beach to play in the surf. When it comes to Israel, even some Israelis are insane. I’ll end with the dumbest “eyewitness” account I found. This man got totally carried away, like a five-year-old embellishing a nightmare he had. Sorry, Pallywood. This mess was even more amateurish than the fake sniper video. Wow. An Israeli tells me that I was right: The IDF is equipped with a miniature missile, which it uses against terrorists. This information is declassified, by the way. There are two models: Mikhol (“Painter’s brush”) and Mikholit (“Mini-Painter’s Brush.”) These are antipersonnel missiles, fired at just one or two people at a time. 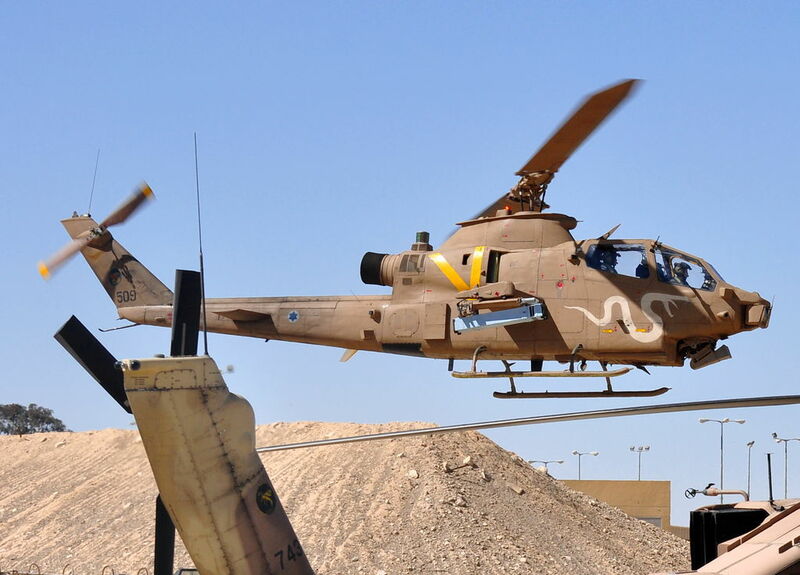 Here’s a photo of an Israeli Air Force Bell AH-1 Cobra attack helicopter, a craft that was phased out in late 2013. The light-blue box under the yellow “V” is the launcher for the Mikhol or Mikholit. 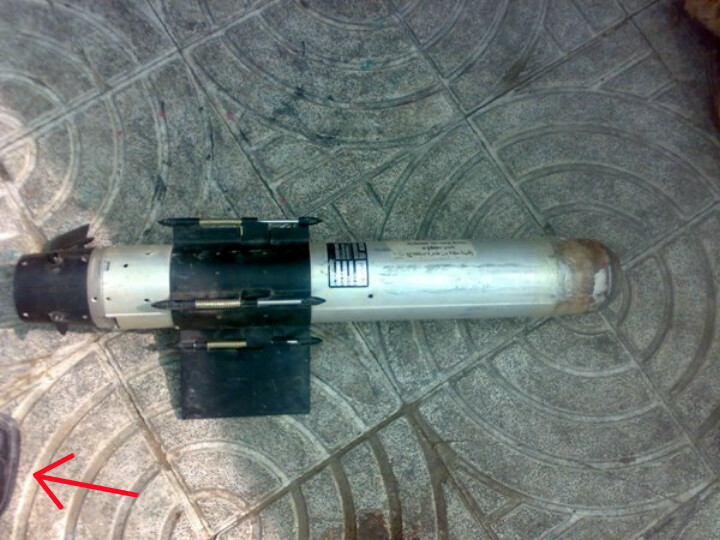 This is part of a miniature guided missile recovered by Palestinians. You can judge the size by noting the edge of the shoe marked by the red arrow. The black cuff around the middle shows how the folding wings are attached. Although the speculation is that the Cobra gunships have been replaced with armed drones, Israel will neither confirm nor deny that their UAVs can fire missiles. Do fake victories really count? This article viewed 6734 times.